© Copyright 2010 JBoss Inc. The Services Guide contains important information on changes to JBossESB 4.8 since the last release and information on any outstanding issues. This guide is most relevant to engineers who are responsible for administering JBossESB 4.8 installations. JBossESB 4.8 Getting Started Guide: Provides a quick start reference to configuring and using the ESB. JBossESB 4.8 Programmers Guide: How to use JBossESB. JBossESB 4.8 Release Notes: Information on the differences between this release and previous releases. JBossESB 4.8 Administration Guide: How to manage the ESB. Questions or comments about JBossESB 4.8 should be directed to our support team. As the W3C puts it: An SOA is a specific type of distributed system in which the agents are "services" (http://www.w3.org/TR/2003/WD-ws-arch-20030808/#id2617708). Service provider: allows access to services, creates a description of a service and publishes it to the service broker. Service broker: hosts a registry of service descriptions. It is responsible for linking a requestor to a service provider. Service requester: is responsible for discovering a service by searching through the service descriptions given by the service broker. A requestor is also responsible for binding to services provided by the service provider. The URI used by JAXR to query. The list of interceptors that are applied to the configured registry. The codebase currently provides two interceptors, one for handling InVM registration and a second for applying a cache over the registry. The maximum number of server entries allowed in the cache. If this value is exceeded then entries will be evicted on a LRU basis. The default value is 100 entries. The validity period of the caching interceptor. This is specified in milliseconds and defaults to 600000 (ten minutes). If this value is zero (or less) then there is no expiry specified on the cache. The Organization Category name for the ESB instance. Default is "org.jboss.soa.esb.:category". 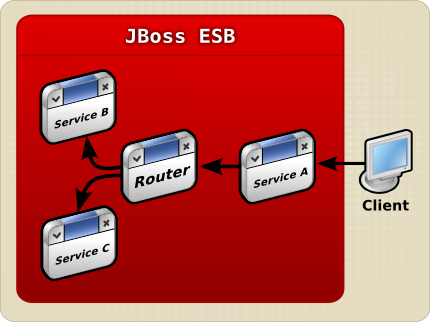 The JBoss ESB Rule Service allows you to deploy rules created in JBoss Drools as services on the ESB. This is beneficial, because it means you don't have to develop as much client code to integrate rules into your application environment, and rules can be accessed as part of an action chain or orchestrated business process. To understand these types of services, you should first learn about JBoss Drools. Rule Services are supported by the BusinessRulesProcessor action class and the DroolsRuleService, which implement the RuleService interface. While it is possible to use rule engines other than JBoss Drools, only JBoss Drools is supported out the the box. The BusinessRulesProcessor supports rules loaded from the classpath that are defined in .drl files, .dsl files (domain specific language support), and .xls (decision table support) files. These are primarily for testing, prototypes, and very simple rule services. There is no way to specify multiple rule files in the jboss-esb.xml file, so complex rule services need to use the Drools RuleAgent. Use of the Drools RuleAgent is the recommended approach for production systems. A rule set can be created using the Red Hat Developer Studio which includes a plug-in for JBoss Drools, or with Eclispe 3.3 and the plugin installed (see Drools download site for the plugin). Since the message is added as a global, you need to add jbossesb-rosetta.jar to your Drools project. You can also write your rules using Drools BRMS business rule editor. When using the Drools BRMS, it is not necessary to add the ESB Message class to the imports, as long as jbossesb-rosetta.jar is somewhere on the classpath of the BRMS web application. N.B. In ESB 4.6 and prior releases, the “continue” functionality for stateful rule execution did not dispose of working memories if the value of the property was false or it was absent. This has now been fixed through the work for JBESB-2900. The previous behavior can be re-enabled by changing the value of the configuration property “org.jboss.soa.esb.services.rules.continueState”, found within jbossesb-properties.xml, to true. Example 1: Rules are in a drl, execution is stateless. Example 2: Rules are in a drl, execution is stateful. Example 3: Rules are in a Domain Specific Language, execution is stateless. Example 4: Rules are in a DecisionTable, execution is stateless. Example 5: Rules are in the BRMS, execution is stateless. Table 1. BusinessRulesProcessor action configuration attributes. Optional reference to a file containing the Drools ruleSet. The set of rules that is used to evaluate the content. Only 1 ruleSet can be given for each rule service instance. Optional reference to a file containing the definition of a Domain Specific Language to be used for evaluating the rule set. If this is used, the file in ruleSet should be a dslr file. Optional property which can be to true to enable 'hot' redeployment of rule sets. Note that this feature will cause some overhead on the rules processing. Note that rules will also reload if the .esb archive in which they live is redeployed. Optional reference to a file containing the definition of a spreadsheet containing rules. Optional reference to a properties file containing the location (URL or file path) to the compiled rule package(s). Note there is no need to specify ruleReload with a ruleAgent, since this is controlled through the properties file. Optional property which can be to true to specify that the rule service will receive multiple messages over time that will add fact to the rule engine working memory and re-execute the rules. NOTE: A single shared session is shared across all Service executions. Optional property to pass Message objects into Drools WorkingMemory. Table 2. BusinessRulesProcessor action configuration properties. It is important to remember that you have to add java import statements on the objects you import into your rule set. It is recommended that you package up your code into units of functionality, using .esb packages. The idea is to package up your routing rules alongside the rule services that use the rule sets. Figure 3 shows a layout of the business_rules_service quickstart to demonstrate a typical package. Figure 3. Typical .esb archive which uses Drools. Also note that the prefixes do not have to match those used in the xml to be evaluated, it only matters that the URI is the same. Now that we have seen all the individual pieces how does it all tie together? It basically all comes down to configuration at this point, which is all done in your jboss-esb.xml. Figure 1 shows a service configuration fragment. In this fragment the service is listening on a JMS queue. Figure 2. Example Content Based Routing Service configuration. Table 1. CBR action configuration attributes. Name of the filename containing the Drools ruleSet. The set of rules that is used to evaluate the content. Only 1 ruleSet can be given for each CBR instance. Optional reference to a file containing the definition of a Domain Specific Language to be used for evaluating the rule set. This property points to a rule agent properties file located on the classpath. The properties file can contain a property that points to precompiled rules packages on the file system, in a directory, or identified by an URL for integration with the BRMS. See the “RuleAgent” section below for more information. Optional property which tells the RuleService to use a stateful session where facts will be remembered between invokations. See the “Stateful Rules” section for more information about stateful rules. A set of route-to properties each containing the logical name of the destination along with the Service category and name as referenced in the registry. The logical name is the name which should be used in the rule set. Table 2. CBR action configuration properties. It is important to remember that you have to add java import statements on the objects you import into your rule set. Finally, the Object Mapper cannot flatten out entire collections, so if you need to do that you have to perform a (Smooks-) transformation on the message first, to unroll the collection. By using the rule agent property you can use precompiled rules packages that can be located on the local file system, in a local directory, or point to an URL. For information about the configuration options that exist for the properties file please refer to section 9.4.4.1. The Rule Agent of the Drools manual. By using the rule agent property you can effectively integrate your service with a Business Rule Management System (BRMS). This can be accomplished by specifying a URL in the rule agent properties file. For information about the how to configure the URL and the other properties please refer to section 9.4.4.1. The Rule Agent of the Drools manual. For information about the how to install and configure the BRMS please refer to the chapter Chapter 9 of the Drools manual. It is recommended that you package up your code into units of functionality, using .esb packages. The idea is to package up your routing rules alongside the rule services that use the rule sets. Figure 3 shows a layout of the simple_cbr quickstart to demonstrate a typical package. A number of Transformation Quickstart samples accompany the JBossESB distribution. Check out the "transform_*" Quickstarts1. A number of tutorials are available online on the Smooks website. Any of these samples can be easily ported to JBossESB. GetProcessInstanceVariablesCommand – The the root node variables for a process instance, using the process instance ID. command – required property. Needs to be one of: NewProcessInstanceCommand, StartProcessInstanceCommand, GetProcessInstanceVariablesCommand or CancelProcessInstanceCommand. bpmToEsbVars - Structurally identical to the “esbToBpmVars” property (above). Used with the GetProcessInstanceVariablesCommand for mapping jBPM process instance variables (root token variables) onto the ESB message. reply-to-originator - optional property for the New- and StartProcessInstanceCommands. If this property is specified, with a value of true, then the creation of the process instance will store the ReplyTo/FaultTo EPRs of the invoking message within the process instance. These values can then be used within subsequent EsbNotifier/EsbActionHandler invocations to deliver a message to the ReplyTo/FaultTo addresses. jbpmProcessInstId – required ESB message Body parameter that applies to the GetProcessInstanceVariablesCommand and CancelProcessInstanceCommand commands. It is up to the user make sure this value is set as a named parameter on the EsbMessage body. JBoss and JBossESB also have a special support agreement with ActiveEndpoints for their award wining ActiveBPEL WS-BPEL Engine. In support of this, JBossESB ships with a Quickstart dedicated to demonstrating how JBossESB and ActiveBPEL can collaborate effectively to provide a WS-BPEL based orchestration layer on top of a set of Services that don't expose Webservice Interfaces (the “webservice_bpel” Quickstart). JBossESB provides the Webservice Integration and ActiveBPEL provides the Process Orchestration. A number of flash based walk-thrus of this Quickstart are also available online. Optional. A default CallbackHandler implementation when a JAAS based SecurityService is being used. See “Customizing security” for more information about the callbackHandler property. Optional property that configures a global SecurityContextPropagator. For more details on the SecurityContextPropagator please refer to the “Security Context Propagation”. Path to the keystore that holds a keys used for encrypting and decrypting data external to the ESB. This is used to encrypt the AuthenticationRequest . Optional cipher transformation in the format: “algorithm/mode/padding”. If not specified this will default to the keys algorithm. Note that the authentication context is encrypted and then set in the message context. This will be decrypted by the ESB to perform authentication. See the “SecurityService Configuration” section for information on how to configure the public keystore for this purpose. # The unicode escape is needed only if your CN contains a space. 1Note that some of the ESB Quickstarts are still using the older “SmooksTransformer” action class. The SmooksAction is a more flexible and easier to use alternative to the SmooksTransformer. The SmooksTransformer will be deprecated in a future release (and removed later again).